Is Ten Thousand Pesos Monthly Family Income Enough? Almost everyday, prices of commodities increase so as the frustrations of many consumers. 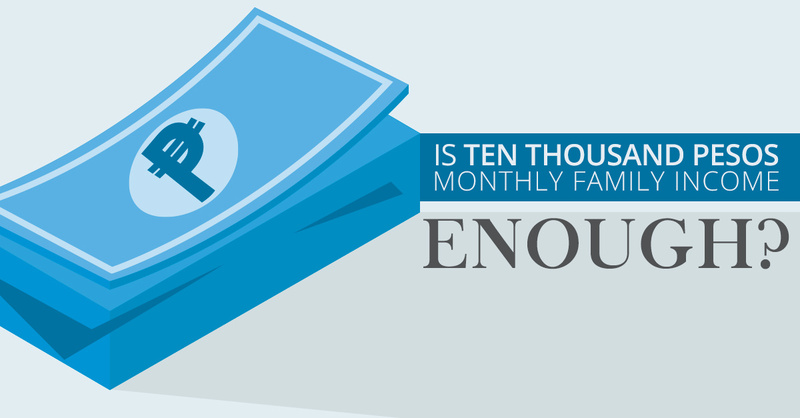 Do you think a ten thousand monthly family income would be enough to have a comfortable life? For some, it may be impossible but for others it is a matter of changing your lifestyle and knowing the tricks of budgeting. Housing takes a big percentage of your budget since renting a house, especially in the city, is expensive. Food & living expenses include your groceries, daily meals, and cellphone loads. Health care plan may also be included in this category. What if you get sick? Do you have money to pay for your hospital bills? Sickness will quickly drain your savings, so better think about the future. Paramount Direct offers health care products for as low as Php69/month for an individual plan or Php175 for a family plan. Education refers to how much you are spending for your kids’ tuition. Sending them to a public school is a better option. Transportation is for your family’s fare to and from work and school. It is ideal to move closer to your workplace and children’s school, so you can save money just by walking. Investment/Savings is a portion that you set aside as soon as you get your paycheck. No matter how big or small, save and consider investing it to make more money. Another product from Paramount Direct is the MoneyPlus Protection Plan which was designed to provide maximum benefits and returns. This plan has Life and Accidental Death benefits plus a Cash Bonus at the end of your coverage. Recreational includes other things like shopping for little things, splurging a bit on food, taking your family to the mall and dining out. 2. Have an extra income - You don’t need to be a business graduate to start a small business or to succeed in joining a direct selling company. There are lots of opportunities out there, you just have to know what the market is looking for so start searching and act now! 3. Change in lifestyle - Check your spending habits. Don’t be an impulsive buyer. Prioritize your needs versus wants. If you are used to spending like “a one day billionaire”, then STOP! Be clever; think of new ways and tricks on how to stretch the Php10,000 monthly family budget.